Does your business need a Twitter account? Is Snapchat the right social media app to expand your brand? Should you just jump on board every popular social network to maximize your reach? With so many social media channels to choose from, deciding which ones deserve your attention can be difficult. Contrary to popular belief, you don’t have to be on every social media platform. In fact, that approach can do more harm than good if you spread yourself too thin. Even large brands with dedicated social media teams often limit their social media presence to a handful of channels. For most businesses, the best approach is to handpick social media channels that make the most sense for the brand, rather than try to be everywhere. Your decision should be based on several different factors including your target audience, industry and social media marketing strategy. If you’ve ever asked yourself whether you should be on Instagram or Snapchat, keep reading. We’re going to break down how to choose the right social media channels for your business, and how to manage all your accounts like a pro. The first thing you should ask yourself is what social networks does your audience use? It doesn’t make much sense to be active on Vine if the people you’re targeting don’t use it. 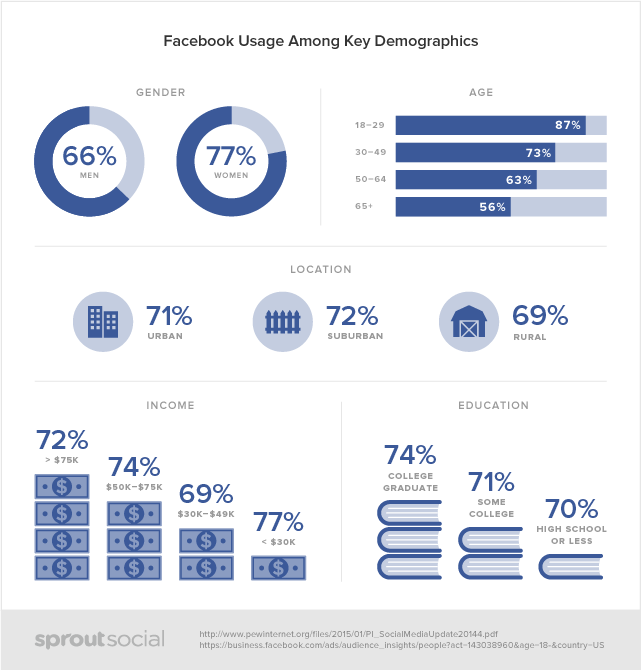 Define your target audience, and match it against these social media demographics. This will give you a great starting point. For instance, if you’re primarily targeting women over 50 years old, Instagram probably isn’t the best option. You’re better off with Facebook or Pinterest. In addition to these statistics, you should also do a manual review of the social networks where you’re interested. Look at the content being published, and who are the actual content creators. If content related to your industry seems to resonate well, it’s a good sign. This approach is great for social networks with very diverse users like Reddit. You can run a search for keywords related to your industry and see if there’s an active audience for it. Don’t choose social networks based on what’s trending. Look for the channels that are popular among your audience. Not every social media channel will work well for your industry. For instance, visually driven industries like fashion, cosmetology and dining gravitate toward channels like Instagram, Pinterest and Snapchat. These channels rely more on visuals than text, so they’re a great fit. However, software companies have seen a lot of success with Twitter because they can curate content and pull users into their site. The first question is important because companies don’t tend to be too active on a social media channel that’s not giving them results. Whether it’s driving traffic to their site or generating leads, there’s a reason they’re more active on one channel over another. Paper towel brands Scott, Brawny and Bounty regularly update their Facebook and Twitter accounts. But their Instagram accounts are either inactive or nonexistent. Social media engagement is crucial because it shows there’s an active audience. When we talk about engagement, it’s not about the size of the brand’s account. How many likes, shares and comments do their posts have? Having hundreds of thousands of followers doesn’t mean much if they’re not active. Which Social Media Channels Already Bring Traffic? Sometimes the answer to which social media channel you should use is right in front of you. If you’re in a position where you’ve been giving multiple social networks a try, but want to focus on just a few, this tip is for you. Look at how many visits your site currently gets from social media. You can find this in Google Analytics under Acquisition & Social & Network Referrals. If you’re already getting traffic from certain social networks, start focusing your efforts there. Look at your social media analytics to find your best performing posts, then create a strategy for growth. Niche social networks are very popular right now. Everyone talks about Facebook, Twitter and Instagram, but you’ll rarely hear of sites like Untappd or Doximity. However, these social networks have the advantage of being very targeted and less competitive. Their audiences may seem small when compared to sites like LinkedIn and Pinterest, but the numbers aren’t anything to laugh at. 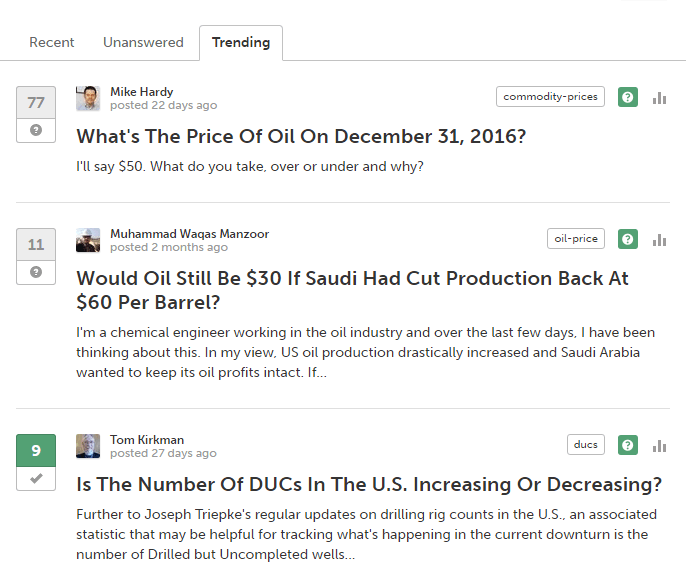 Oil Pro is a social network for the oil and gas industry. Despite serving a very niche audience, the site has over 650,000 users that publish industry relevant content. Niche social networks solve one of the biggest challenges businesses face on mainstream channels. You don’t have to fight for the attention of your audience. Platforms like Facebook, Twitter and Instagram cater to multiple industries. People aren’t joining for the sole purpose of getting news about your industry. Some people use Instagram to follow celebrities, others use it to stay in touch with friends. But with niche sites, the users are there because they’re interested in your industry. You content doesn’t get buried beneath a mountain of Justin Bieber headlines. Most brands completely neglect this step when choosing social media channels. Before you make your decision, think about how you want to use social media. Specifically, what type of content do you plan on publishing on social media? Curation: If you plan on curating content and sharing a lot of links, consider Twitter and Facebook. These platforms thrive off of people sharing articles. They even include thumbnails, snippets and other features to highlight blog posts and articles even more. For B2B companies, LinkedIn is also a great choice. Company news: Facebook and Twitter will be your two top choices. Consumers expect to find news about product launches or events on these sites. Videos: You have a lot of options if your social media strategy is video driven. Facebook, Snapchat, Periscope, and Vine are all good options. Facebook videos are very hot right now, with users watching 100 million hours of video a day. But platforms like Snapchat and Periscope will allow you to put a different twist on video marketing. And of course, YouTube is always a solid option. Pictures: Visuals rule social media, and that doesn’t only mean videos. Social Media Examiner found 71% of online marketers use visual assets in their social media marketing. If you want to share photos or even custom graphics like infographics, look at Instagram, Pinterest or Tumblr. Many businesses overlook Tumblr, but it’s a great platform for targeting a younger demographic. Nearly 70% of its users are millennials. Netflix is the perfect example of how effective images and GIFs can be used on Tumblr. Branding: A lot of companies use social media for branding purposes. So the content they share is a mix of funny and entertaining videos, pictures and articles. Instagram and Snapchat are great for branding because users are highly engaged. On top of that, both of these mobile-first apps focus heavily on content, and less on advertising. Lead generation: For lead generation, LinkedIn is the clear winner for B2B social media. However, if you’re serving customers, it’s hard to argue against Pinterest. A Shopify study found 93% of those on Pinterest use the platform to plan purchases, and 96% use it to gather product information. As you probably guessed, the best approach is a combination of different social media channels. Not only will you have more reach, but it adds variety to the content you’re giving your audience. Juggling three or four different social media profiles for your business isn’t as simple as it seems. There’s more to it than finding an article and sharing it across every social media channel. In order to be successful, you need to provide a unique experience on each platform. The first step is getting a social media management tool. This will put all of your accounts in a central dashboard so you don’t have to log into five different apps. From there, put your strategy into practice, measure your efforts and track the results. You have to engage on every platform, so organization is key. The moment you start to neglect your audience, you’ll lose their attention. This is one of the biggest challenges businesses have with social media marketing. They’ll stop replying to Twitter mentions or Instagram comments because they’re busy on a different social network. When that happens, your followers feel less connected and will move on. 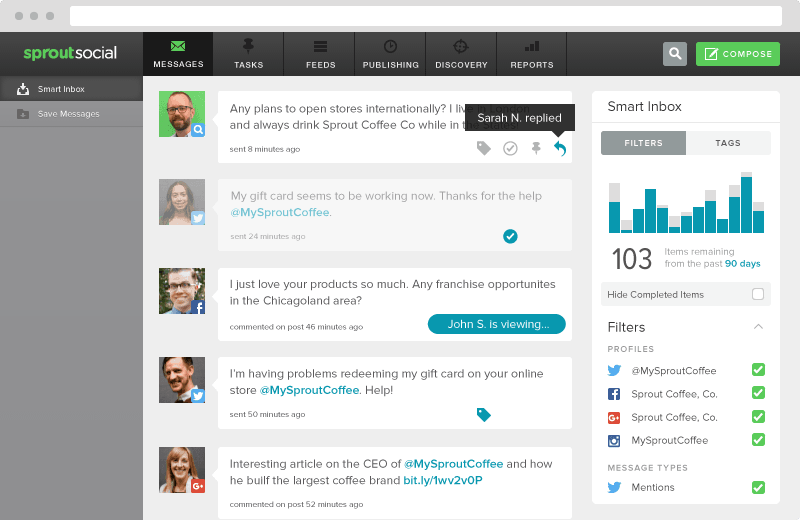 This is why your social media management tool will become your best friend. With Sprout Social’s Smart Inbox, you can read and reply to all of your messages across Facebook, LinkedIn, Twitter and Instagram so you don’t miss out on important conversations or opportunities. It’s perfectly acceptable to start slow. Pick your top two or three channels to focus on based on the tips we gave above. You could even start with one. Simple Green Smoothies strictly focused on Instagram, and built an engaged community before jumping to other platforms. As you start to have success, expanding to other channels will become easier because you’ll already have a loyal following. How did you decide which social media channels to focus on for your business? Leave a comment and let us know.